The ESMA E888R recessed ultrasonic cleaner is a traditional, recessed ultrasonic cleaner with a sleek design and robust construction. 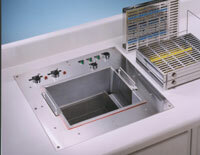 This single-tank, counter-recessed unit is designed for use in dental, medical, veterinary, or lab instrument presterilization preparation. The E888R is completely constructed of stainless steel and has a sleek, flush-mounted design. With a large solenoid drain valve and a water fill solenoid valve, the E888R provides auto-draining, as well as auto-filling for convenient changing of ultrasonic detergent. Filling and draining of the solutions is as simple as flipping a switch. A 200 watt tank heater maintains solution temperature at 110°F, enabling maximum ultrasonic cavitation.